Restaurants : Carson Street Cafe, Grotto Ristorante, Vic & Anthony's, Lillie's Noodle House, The Buffet. Standard room amenities : Air conditioning, alarm clock, cable TV, desk, hair dryer, in-room safe, iron and ironing board, PPV movies, radio, telephone with voice mail. Hotel amenities : Beauty Salon, laundry service, luggage service, maid service, safety deposit box, wake-up call. 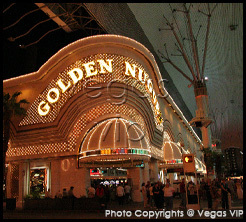 One of Vegas' most storied names, the Golden Nugget Hotel & Casino is one of the founding members of Fremont Street. Poised to take the downtown area to a new level, the Golden Nugget is now owned by Landry’s Restaurants, Inc. and commits itself entirely to the pleasure and comfort of its guests. The dining at the Nugget is some of the most celebrated in town, including the gourmet delicacies of Vic & Anthony's and a buffet that is simply the best. 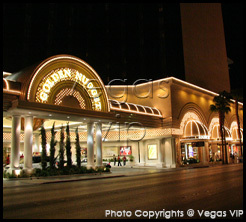 The 36,000-square-foot casino accommodates every kind of gambler, from the novice to the high roller. To boot, the dazzling lights of the Fremont Street Experience are mere steps away. The hotel offers 1,907 rooms and suites with views of the Vegas skyline, mountains, or pool terrace. Amenities include semi-canopy beds and high-speed Internet access.